Waterway Recovery Group – Forestry (WRGF) Team Leaders Tim Herd and Nigel Lee were in action at Ryeford on Friday 10th April. The pair used a ‘Cherry Picker’ or more properly… a Mobile Elevated Work Platform (MEWP). The trees have grown untended for many years. The crowded and heavy nature of these leaning trees creates a risk of them falling over causing the root to tear up the towpath. If this occurred it would allow the canal to drain into the mill stream. Such a breach would be both costly and difficult to rectify. Even with the advanced skills of WRGF, pollarding the trees proved very difficult from ground level on the narrow causeway forming the towpath between the two bodies of water. WRGF leader Clive Alderman decided that his team needed a MEWP positioned in the yards of the Ryeford Trading estate across the mill stream. The MEWP was hired for the day from Ermin Plant in Gloucester. The machine has a maximum horizontal reach of 34 feet and a height of 60 feet. WRGF volunteers Tim and Nigel were trained and certified in the use of the machine by Rob Fletcher, a specialised MEWP trainer based in Bedfordshire. 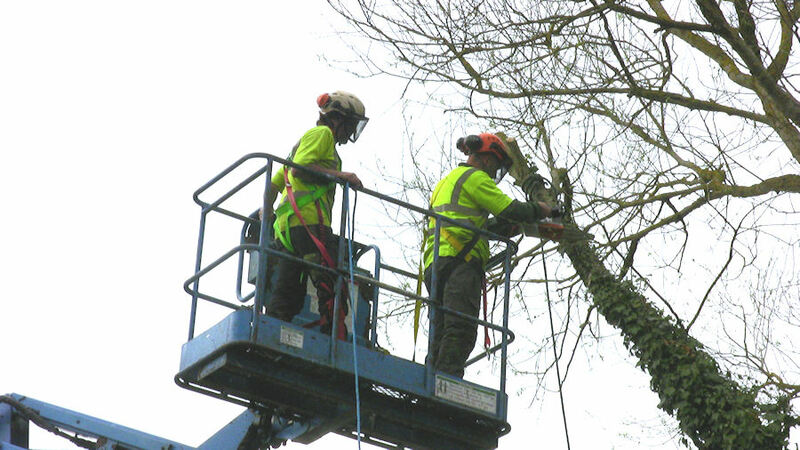 The capabilities of the machine and its trained operators meant that chain saws were able to reach across the mill stream to remove the problem branches. 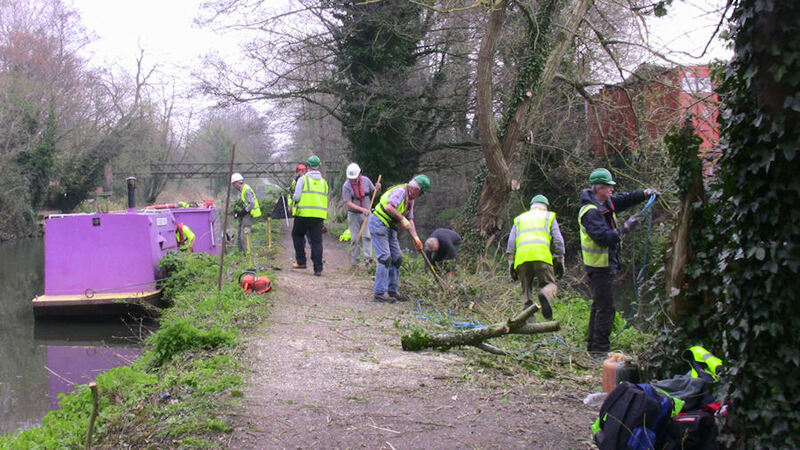 Once the boughs were down on the towpath they were sawn into manageable lengths by Cotswold Canals Trust (CCT) volunteer Alan Jones. A supporting team of CCT volunteers led by CCT Maintenance Operations Director Steve Pickover worked hard all day. The brash and useful logs were transported away on CCT workboats crewed by Iain Tweedie, Peter Snelson and Tony Jones; the 'useful logs' being destined for the Cotswold Canals Trust Log Delivery Service. Steve Pickover commented… “Thanks are due to all those who worked hard to make this a very successful day. We are also very grateful to Veolia and to Cristom Construction for allowing us access to their respective premises at Ryeford in order to carry out these works." Steve also expressed his gratitude to John Parker a local person educated at Wycliffe College. John is a qualified arboriculturalist who has volunteered to help CCT plan a programme of tree works. Part of John’s plan is to allow the pollarded stumps to regrow and to then to harvest usable willow from them on a regular cycle. This thinning work will enable the regrowth to receive good light levels and thereby grow straight without leaning dangerously across the canal or mill stream.